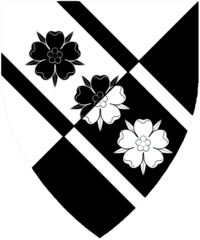 Per bend sinister argent and sable, three roses in bend between two bendlets, all counterchanged. German women in the late 14th Century, who is the daughter of German Baronet and a silk road merchant. She was hidden in England so that she would not be stolen or pressed into slavery along the silk road. This page was last edited on 6 February 2019, at 14:51.